This is one knock out treat that I usually save for an occasion like a birthday, an anniversary or guests coming over. Just the other day, I felt that we deserved a treat, for no particular reason, but just because I felt like it. I am a little funny that way. When I get fixated on something, I usually end up doing it. Very seldom do I change my mind. Exception to the rule being, if I don't have the necessary ingredients at home. Then, off course, I have to improvise and work with what I have at hand till I can get to the store and stock up again. Anyway, back to the prawn cocktail. This beauty is a hit every single time. It is ridiculously easy to make and you can make it a little ahead of time. Get ready to wow your guests with this one. In a bowl, mix the mayonnaise, tomato sauce and Tabasco sauce. Add the pepper. Taste and adjust seasoning, if needed. If you want it more tart, add some more tomato sauce. If its too tart, add a little more mayonnaise to balance it. Up the spice levels with the Tabasco sauce. Tip in the prawns and mix till well coated. You should typically have more cocktail dressing than whats needed to simply coat the prawns. 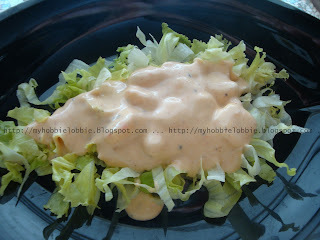 If you're serving individual portions as a starter, place some of the lettuce at the bottom of a cocktail glass and top it off with the prawn cocktail dressing mix. Garnish with a prawn placed on the rim of the glass. If you're serving it more like a salad that people need to help themselves to, place a bed of chopped lettuce on the plate. Pour the prawn cocktail dressing mix over. Simply mind-blowing and perfect looking prawn cocktail. Loved the pics. This looks rich and delicious! Thanks for linking up on Recipes I Can't Wait to Try!! !